Group class in addition to private lessons is a cornerstone of the Suzuki method. Students who participate in group and private lessons advance through the repertoire at a faster pace and have more fun while doing so! Group learning reinforces the musical and technical concepts taught in private lessons while introducing the social aspect of music making. We find that the motivation students receive from each other often goes farther than that of the teacher or parent. The encouragement and support of a community of teachers, parents, and peers is part of what makes South Side Suzuki so special for our students. Suzuki Book 1 Class: This class is geared towards any student working on twinkle and book 1. This class is taught by Miss Hilary at 9am on Saturdays at the Reva and David Logan Center for the Arts. Suzuki Book 2/3 Class: This class geared towards violinist currently in Suzuki books 2 and 3. This class taught by Mr. Andrew at 10am on Saturdays at the Reva and David Logan Center for the Arts. Suzuki Book 4 Class: This class geared towards violinist currently in Suzuki book 4. This class taught by Miss Hilary at 11am on Saturdays at the Reva and David Logan Center for the Arts. 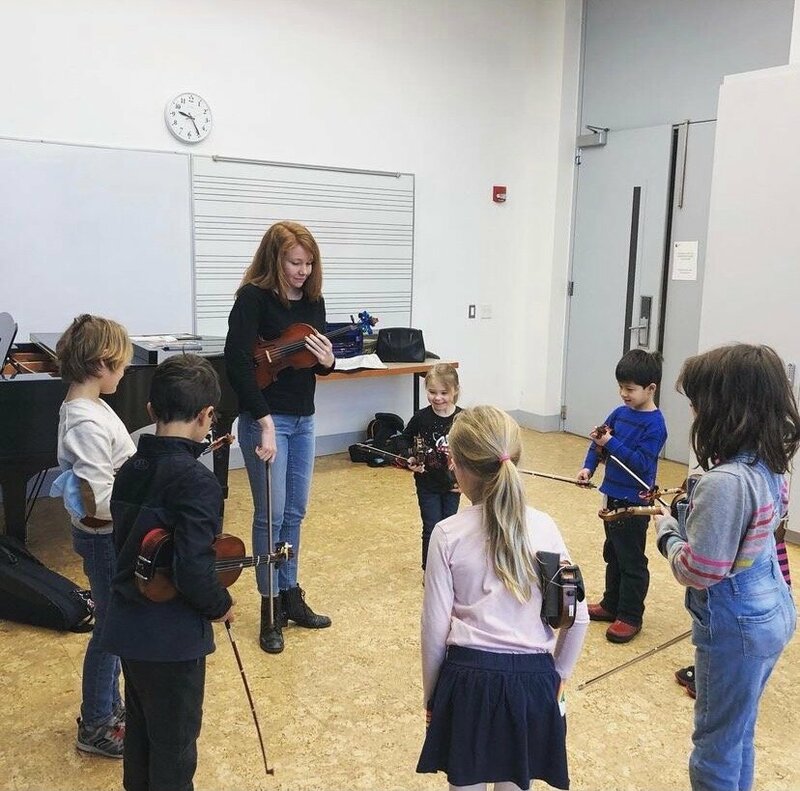 Register for Violin class here! String Quartet: This class is geared towards intermediate - advanced violinists, violists, and cellists. Limited spots are available. Please inquire with Miss Hilary before registering for this course. This class is taught Saturdays by Miss Hilary at 12pm at the Reva and David Logan Center for the Arts. register for an ensemble class here! 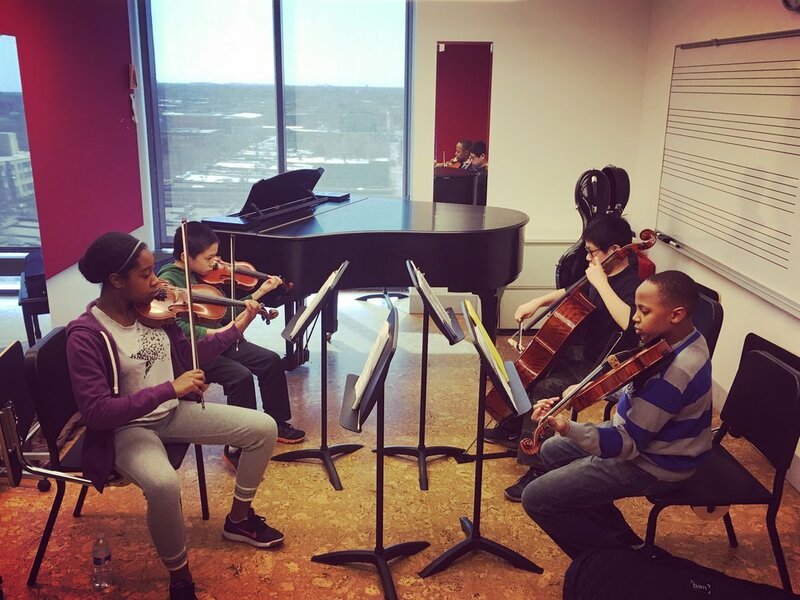 Performance Class: Performance Class is designed to give intermediate and advanced students the opportunity to collaborate with a pianist and receive feedback from their peers as well as SSSC faculty. The goal of this class is to foster a sense of confidence and mastery of the stage once our students have graduated from the traditional Suzuki group classes. Students should be prepared to perform and give comments in every class. Violinists, Violists, and Cellists are welcome to participate in Performance Class. Performance Class meets the first Sunday of every month at 1pm. This class is currently run by Miss Hilary. Register for Performance Class Here!